Kids of all ages love balls. As fun as it is to play ball, traditional soccer and basketballs, even in kid sizes, can be hard to bounce (not to mention hard to bounce back from if you catch one in the face). Lighter than a regular-sized soccer ball and covered in soft fabric, the Ya’ll Ball is all bounce, no ouch. 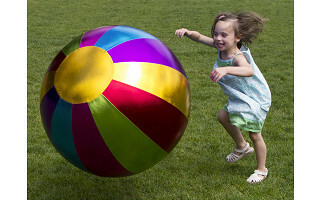 From the playroom to the beach and back to the yard again, this inflatable ball is the ultimate in family-friendly fun. Available in a range of vibrant colors and in size large or extra large, the Y’all Ball is designed for extra bounce and durability. To inflate, you can use any household ball pump or buy a Y’all Ball double action pump. Y’all balls deflate easily for quick storage. The polyester surface slips off and wipes clean when you’re done. But chances are, the kids won’t want it to remain deflated for long. Greetings from all of us at Y'all Ball™!! We are excited and thrilled to introduce you to these soft, safe and incredibly bouncy inflatable play balls! We are the 2013 ASTRA Best New Toy Winner!! Our play balls are made with fashionable and colorful fabric coverings in different patterns; they are surface washable and great for tons of outdoor play. We are happy to answer any questions you may have! is the ball sturdy enough for a 14-year-old to sit on and bounce? My daughter loves to bounce while listening to music and the fabric covering would be nicer than the ratty old exercise ball she is using now. Hi and thanks for the question. Y'all Balls™ can withstand a fair amount of weight however, we discourage use of the ball for exercise. It is strictly designed as a play ball. I've taken exercise balls and covered them with a cover. The purpose is for use with my dog. They love the things. In our yard, there are sticks, which tend to puncture the balls through the cloth. My guess is that these balls would suffer the same fate? Not complaining, just trying to find a solution to my problem. Yes Walter, sticks, thorn bushes or dog's teeth and the like can puncture the bladders of the Y'all Balls™. The balls are age graded for children 3+....sorry we can't offer a solution to your situation. @Christine for the gent asking about use with his dog - he could try the Equi Spirit website for the Jolly Ball that we use with the horses. thanks for the tip Terri! And hope your nephew enjoys his Y'all Ball™!! We have found that the bright colors and patterns are very useful in visual stimulus and therapy. The bladder in the Large ball is attached to the outer covering at the valve and is not able to be patched if punctured. However, the Extra Large Ball (32" in diameter) does have a removable bladder and replacement bladders are available at [email protected] We have found replacing the bladder is a better alternative than trying to patch it, especially if the puncture is more than a small hole. 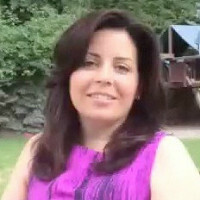 Hi @Nancy - you can access the smaller ball here: http://www.thegrommet.com/yall-ball-giant-bouncy-ball-large-22. We had a glitch on our end. The balls should all be showing up above now! Kids of all ages love balls. As fun as it is to play ball, traditional soccer and basketballs, even in kid sizes, can be hard to bounce (not to mention hard to bounce back from if you catch one in the face). Lighter than a regular-sized soccer ball and covered in soft fabric, the Ya’ll Ball is all bounce, no ouch. From the playroom to the beach and back to the yard again, this inflatable ball is the ultimate in family-friendly fun.